I really didn't want to write this blog post. This morning, I thought about writing something about the tragedy in Jerusalem, but my stomach told me "no." I just didn't have the energy to do it. I awoke this morning feeling better than I had in the past couple of days as I was "down for the count" with the stomach flu. When my eyes opened at 6 AM, I thought about how I didn't feel nauseous. But then I grabbed for my phone, took one look at the "Breaking News Alert" on the screen, and then my stomach immediately returned to that queasy feeling I thought I had beaten. 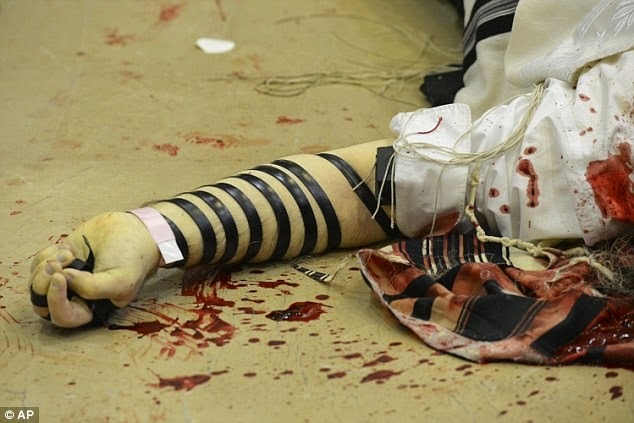 Through still sleepy eyes, I read something about a terrorist attack in a Jerusalem synagogue during morning prayers. And then I read the words "gun, knives and axes." 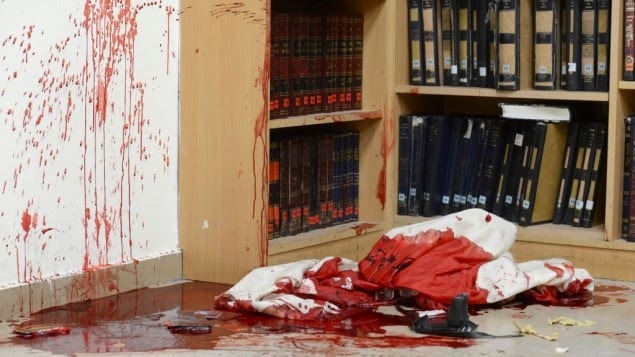 It was a bloody mess in the Har Nof synagogue. Miraculously there were only five murders. It could have been a lot worse. No doubt, the terrorists were planning a massacre. I didn't want to write about this. As David Horovitz expressed today, "Nobody wants to write on a terrible day like this, but there are some points that have to be made, nevertheless. It's senseless. I think we all try to deflect just how horrific an act this was by shifting focus onto how it's covered in the media. And I'm just as guilty of this as anyone. It would have been easier for me to write about how CNN completely botched a headline this morning by substituting "mosque" for "synagogue" or how CBC News ran a headline on its Twitter feed stating, "Jerusalem police fatally shoot 2 after apparent synagogue attack." It's much easier reading about gaffe headlines and unfair media reports than seeing the shocking photos of this vicious attack on innocent civilians who were preoccupied with their prayers for peace. This evening, as I sat in front of my computer screen watching videos of some of the news coverage of this tragedy, my children came into the room. They asked what had happened. I tried my best to explain. Each of them just kept saying, "I don't understand." So, I tried to use different words to convey this horrific situation (even though there aren't any words). But then another child said, "I don't understand." Finally, I closed the video of the news coverage on my monitor and looked at my three children and with that sharp pain in my stomach, I shrugged my shoulders and said, "I know. Me neither." Yes, Rabbi,Jason, I too can't understand how this can happen not in Bialik's City of Slaughter but in thenState ofnIsrael, the Jewish state which my own parents came in the Eros 1920's to help rebuild. I too can't find the words to express the excruciating pain I feel. I too can't understand and therefor can't find the words. That this would happen in our astute ofbIstael that my parentsncamento help rebuild so this could never happen? It's beyond comprehension. יהי זיכרם ברוך.